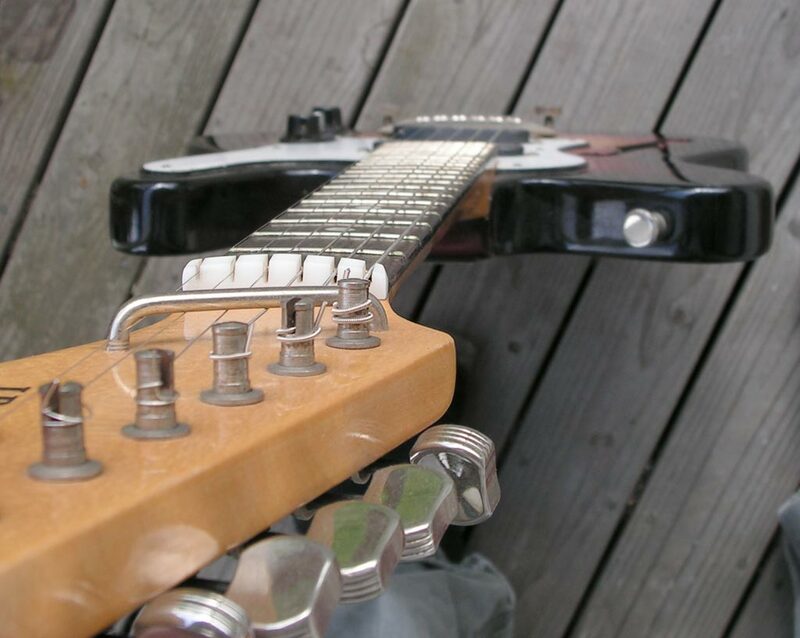 Note the zero fret and the unusually deep nut. 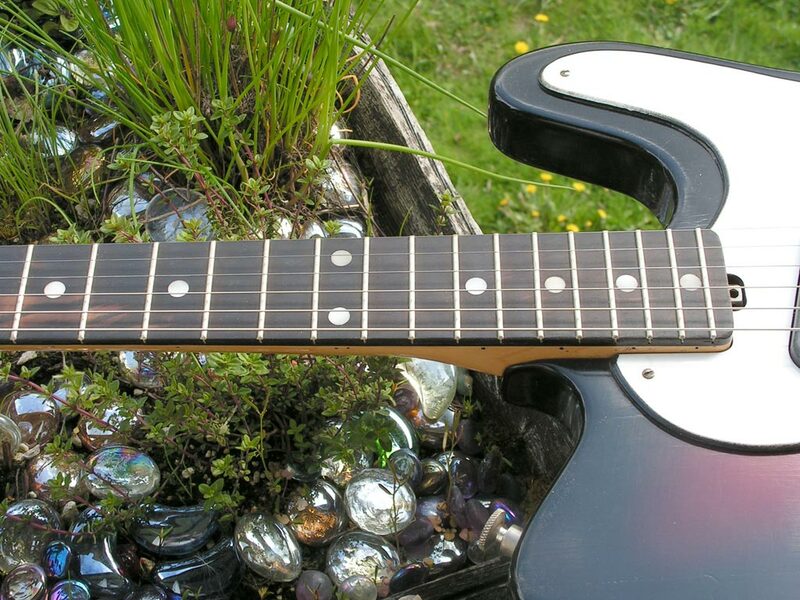 the string retainer bar, like many details, harkens to Hagstrom. 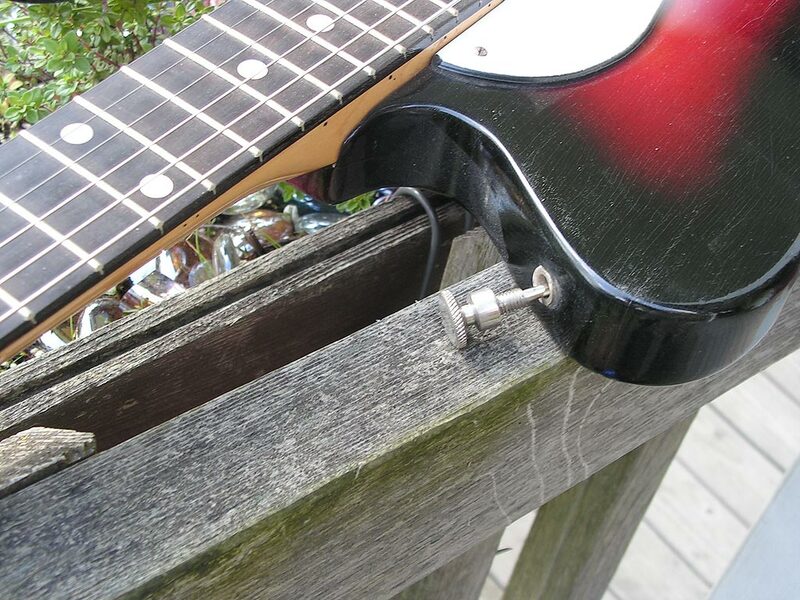 the bridge is very sensibly adjustable with thumbscrews, for easy action adjustment. The bridge is actually floating, too. That's one way you can tell these are good instruments, they respond well to good setup. 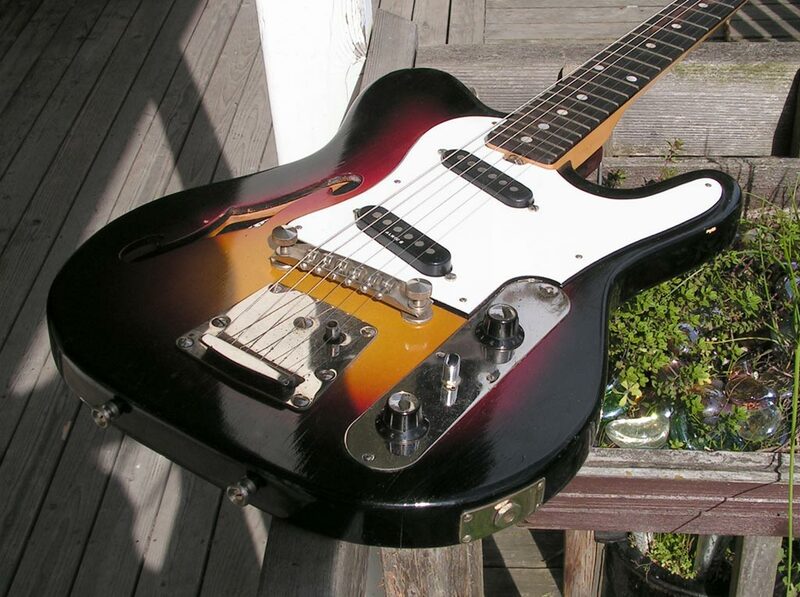 The controls and pickguard are obviously tele-inspired, the trem bridge is Hagstrom style. For those who haven't tried this kind of bridge, it works very well, keeps tune well, certainly as well as any strat-style bridge. The middle knob on this one is incorrect, it took me the longest time to find a knob that woudl fit the really slim split shaft of the the selevtor switch -- I finally found a good fit in a box of old TV knobs, I think it was originally a fine tuning knob. This selector switch is serious voodoo, too. It not only switches between neck and bridge, but numerous combination of them both for a really wide tonal range. I wasn thinking all 'this has got to be like series and parallel like an MPC right?'. And I pulled the cover and looked at the switch -- it's a nightmare coldwar cylinder that probably decodes plaintext ciphers too. I don't have a picture of this thing but imagine a cold-war era designer tasked with using up a bunch of electronic parts from old tvs... as a result you have amazing tonal possibilities here. These pickups are known for sometimes being a little weak in signal, but they make up for it with killer tone. And that's what gain is for, right? 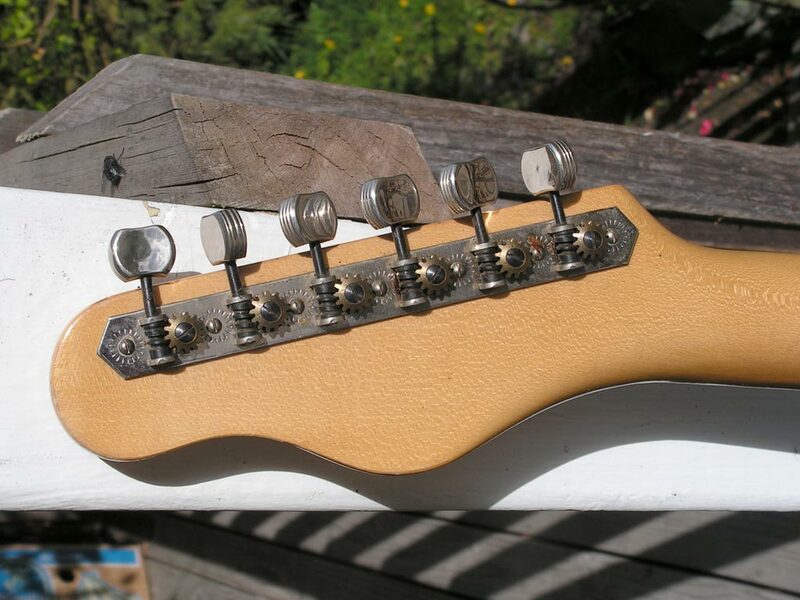 The tuners are obviously iron curtain stuff, but they're really well designed and made. Czech stuff in general is really good quality with modest materials. Check the micro flame in that wood though. 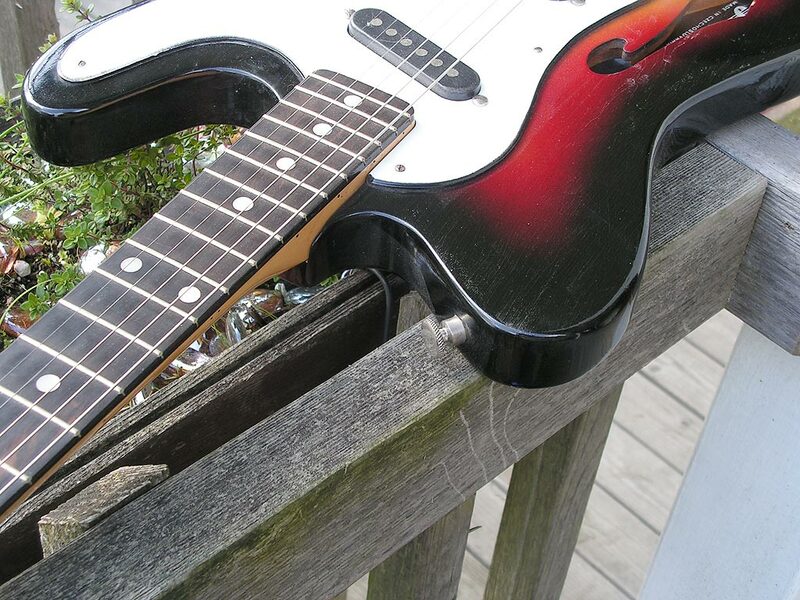 This is good wood, and the neck is dead straight and takes a curve well with careful truss rod adjustment. 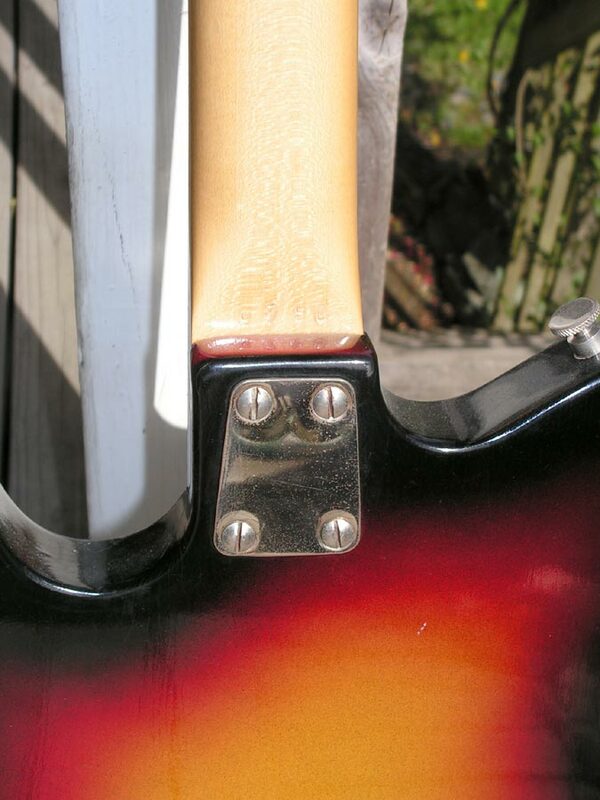 The neck is classic D-shaped, a bit narrow, with nice big fret markers. It's a good neck! Thsi shot not only captures the label in there but also gets the texture of the finish right. The body is laminated layers and the finish is paint, not varnish. Humble materials,. but the attention to detail is very good indeed. 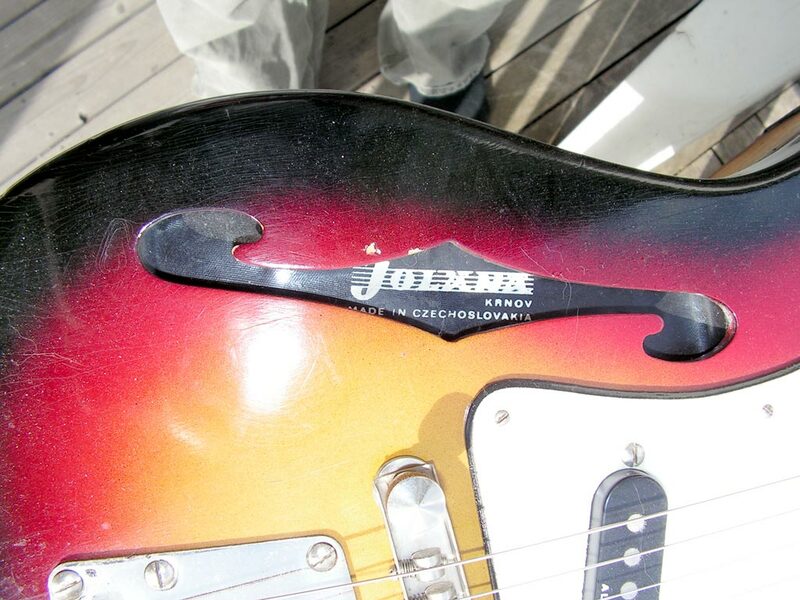 And then we come to one of the coolest features of the Iris and some other Jolana guitars. We're talking first-rate James Bond style features here, from the cold war era. Keep your eye on that upper strap button. Yes, it unscrews. very observent. The Jolana is thoughtful enough not only to rpvide this very fine quality screwdriver, suitable for adjsuting certain screws on the guitar. But it also leaves a hollow compartment suitable for storing microfilm or other cold war era espionage goodies. 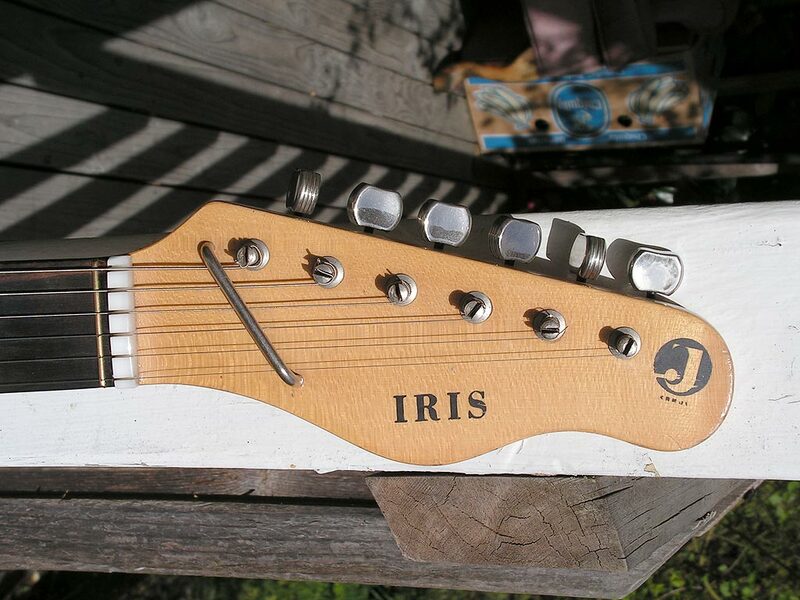 Solid guitar, thin twangy tone, it's a killer, this Iris. And they aren't that uncommon. You'll see them on ebay a couple of times a year, but the best place to find them is on german ebay.Apparently to the germans it's just more eastern trash, they don't pay much attention. Figure on paying 100$ to ship it and you could find your own Iris. This particular one I photographed to sell it on ebay but ended up giving it to my brother instead, who loves it. I have another one like it (but with the rare bridge cover and original vinyl gig bag) as well as a REALLY cool fretless Iris shortscale bass! For teh bass player it doesn't get much better. I'll call that one back home and get some pics soon. That is indeed cool. 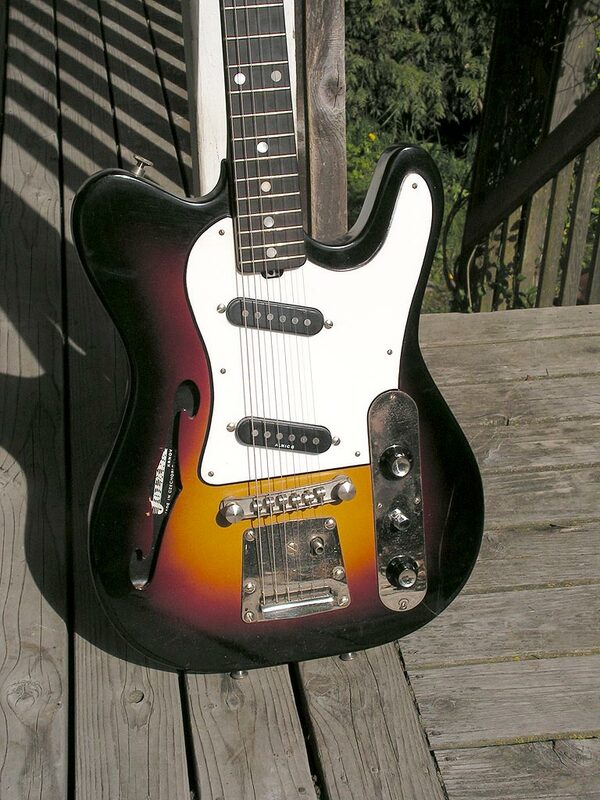 Is the body sorta semi hollow, or is the f hole cosmetic only? It's pretty much as functional as it is on a thinline- not much, but it probably affects resonance a little and who knows at high volumes. I got a kick out of that screwdriver. That was a really good idea on the creator's part. Looks like a really sweet guitar. 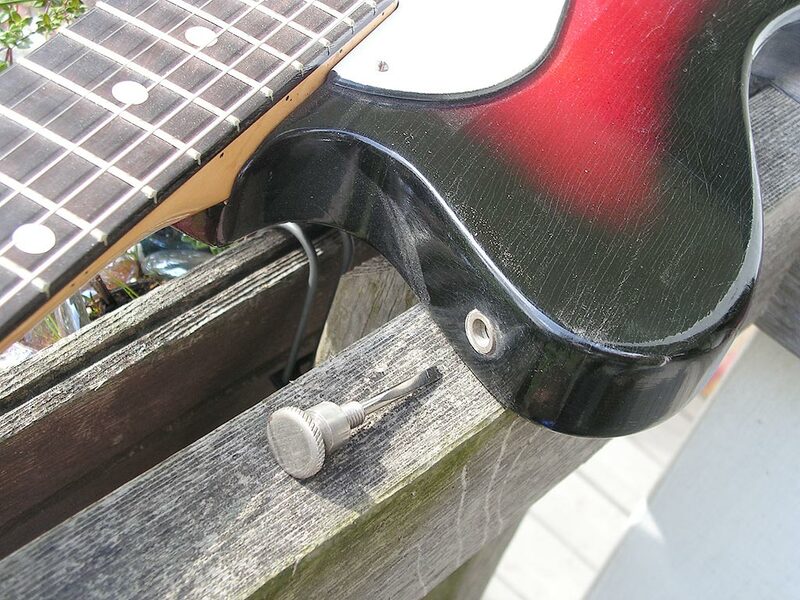 those screwdrivers are too darn bad to use : some of'm are too tick so you can't use it on the guitars screws , or too chromed/nickeled with drops like surface , or too weak so if you use it on a screw it breaks off or plies in S-shape ...etc !!! !